One owner garage kept luxury Lincoln town car. Executive series fully loaded with all the extras available for that year. We have the original owners manual and maintenance documents. This car was owned by my mother and parked when she became unable to drive. Since her passing I have tuned it up and made it road worthy would make a great safe and comfortable car for anyone. 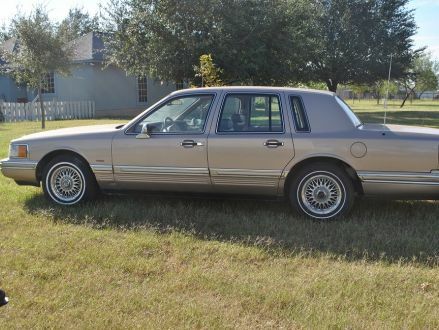 One owner original miles luxury Lincoln town car. FOR SALE. This is a Champagne 1992 Lincoln Town Car Executive Series with Beige interior, Automatic transmission, Rear-Wheel Drive, and a 8-Cyl. engine. It's in Excellent condition, with 183,000 miles, and located in Adkins, TX.